Two boys, ages 11 and 14, were coaxed into going out a third-floor window and making their way to a second-floor roof to jump. 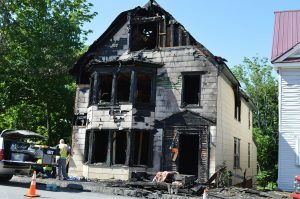 LIVERMORE FALLS — A police officer and family members are being credited with saving two boys who climbed from a third-floor window to the roof of a second-floor bay window and jumped to escape a burning house Tuesday night on Main Street. Amy Mosher said Wednesday that the fire killed her uncle, Peter Dyer. Mosher and her husband, Robert, who are both 35, and their two sons, Collin, 13, and Brayden, 11, were in the house they rent when the fire started. The boys were on the third floor, and their parents were on the second floor. Dyer was on the first floor. A smoke alarm alerted the family to the fire. Both boys were injured and a family friend, Tory Lebel, who lived with them, is still being treated for smoke inhalation in a Farmington hospital. She also suffered seizures because of the stress, Amy Mosher said. Sgt. Vernon Stevens was on patrol Tuesday night when he heard the fire call and responded, Police Chief Ernest Steward Jr. said Wednesday. The house was engulfed in flames when Stevens arrived, Steward said. The boys were injured when they jumped from the roof of a bay window to an overhang over the front door and then fell to the ground. Collin landed on Stevens, who dove to catch him, Robert Mosher said. Mosher dove for Brayden, who landed partly on his father and partly on the ground face-first, he said. 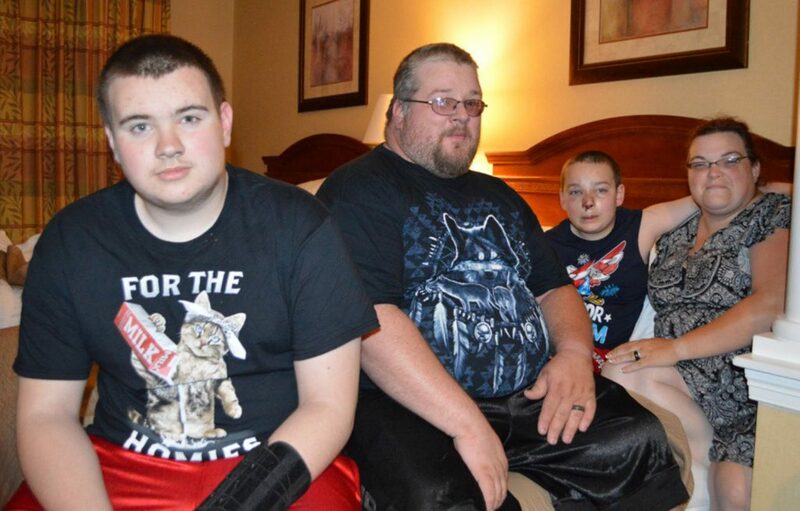 Collin Mosher, 13, and his brother, Brayden, 11, jumped from a third-floor window of their burning home on Main Street in Livermore Falls on Tuesday night. From there, they jumped to a second-floor roof, then to an overhang over the front door and to the ground. A family member on the first floor died in the fire. Brayden’s injuries required 20 to 30 stitches to his left hand, and included a sprained ankle and facial wounds. His middle finger was sliced to the bone, which is believed to have happened when he hit the overhang, his mother said. Collin has a sprained left wrist and a very large bruise on his back, Amy Mosher said. Stevens, who suffered scrapes, was taken to a Farmington hospital to be checked, Steward said. The Moshers were able to escape through a back stairway on the second floor. Robert Mosher said he crawled up the stairs to the third floor and tried to get up to his sons but the smoke was too heavy. He and his wife yelled to the boys and the boys yelled back to them. They told the kids to get out and go out a window. Mosher said he ended up crawling down the stairs to get outside. Collin pushed a screen out of a window on the third-floor and helped his brother get on the roof. “When we were trying to get Peter out, I tried to get back in but I couldn’t see him anywhere,” Amy Mosher said. Dyer was in the front room on the first floor, Mosher said. It was engulfed in smoke and she couldn’t get close, she said. “We’re very thankful to be alive. I can’t thank my oldest enough for saving his brother,” she said. The family is staying at Comfort Inn & Suites in Wilton. They have no insurance. “We need everything. We need a place to live. We lost everything,” she said. Family and friends brought some clothes and food to their room Wednesday afternoon. Brayden started crying when he saw his cousins. Collin, an eighth-grader at Spruce Mountain Middle School in Jay, takes size 34-30 pants and a large to extra-large shirt. Brayden, a fourth-grader at Spruce Mountain Elementary School in Jay, takes size 12 to 14 pants and shirts. Anyone who would like to donate can call Robert Mosher at 491-2264. Both he and his wife lost their jobs Tuesday morning, he said. Mosher’s CPAP machine, which is a type of ventilator, was also lost in the fire.